The Winstar LCDs like those used by Rev-Ed (and other LCDs too) have unused pads on them including space for an 8-pin chip. This is designed to allow a 3V version of the display to be sold by having a negative voltage generator built into the LCD module and present on one pin of the LCD module. 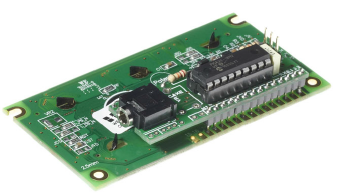 Since the pads are there, there's no reason why this ability cannot be retrofitted to a 5V display where the controller used will work down to 3V (most are rated down to 2.7V but should go even lower). The voltage converter used is the usual chip used on GLCDs - 7660. The minimum components required to add the converter is the 7660 and two capacitors. See Figure 13 in this datasheet - the capacitors required are C1 and C2 which are also marked this on the Winstar LCD. It is also preferable to install a third capacitor on the C3 pads (these are connected across the V+ and GND pins of the 7660) as a decoupling capacitor but it isn't fitted in my picture. One of the five empty resistor slots also needed to be shorted out as shown in the picture. A resistor can be fitted to the pads to the left of the ones shorted if external contrast control isn't wanted and a fixed contrast setting is preferred. Since there is no 17th pin on the LCD module, one of the backlight pins are used for the Vee output. This is no issue on non-backlit models although there may be a jumper (marked JE on my display) that needs to be shorted in order to connect the negative voltage output to the backlight pin. On backlit models, the jumper with the resistor in the J15 position (in my picture) should have the 0 ohm resistor moved to the J2 position to connect the anode of the backlight to Vdd on the LCD module. The smaller module which can be seen in the very first picture has the pads in different locations and may use different names for the jumpers mentioned so it's best to check all the pads with a multimeter to find out which is which before soldering the components there. That's it! Just connect the negative voltage output (Vee) which is on the pin which is normally the backlight cathode on most backlit LCDs to one end of the pot track and connect the Vo pin to the wiper of the pot. Optionally connect the other end of the pot to 0V (if a 5V supply will never be used with the circuit) or 5V (if a 5V supply might be used with the circuit). The LCD can now be used on a 3V supply. The LCD can still be used on a 5V or 4.5V supply safely even using the negative voltage output (Vee) however if it is used then a higher resistance value pot may be needed. For both of these methods, RB (the backlight resistor) must not be fitted to the RB pads. The LCD + terminal at the edge of the AXE033 PCB will be connected to the free backlight pin of the LCD module. The AXE133 has the track pins of the pot right next to the backlight pins which makes it easy to modify as one pin of the pot can simply be desoldered, removed from the PCB hole then soldered to the backlight pin which outputs the negative voltage. I started to convert a display a couple of year ago and got stuck. My woolly brain can't work out what to do next because my board already has all the resistors in place. I have soldered the voltage convertor and C1 & C2 capacitors. I would be grateful if you could you look at the attached photo and give me some advice as to how I can finish connecting it up? I am happy with a 3v only display. The pads A & K are the backlight power connections. Sorry, I don't think my photo is visible. There only seems to be the ability to hyperlink to a photo on this part of the site (which I thought I had done). I solved it! My LCD is the very cheap and plentiful QAPASS 1602A. It can be modified very easily (now I know what I am doing) by following Nick's "minimum components" instructions to add the 7660 voltage converter and two capacitors (C1 and C2). The crucial step on this particular LCD is to unsolder the "jumper" J1 and solder "jumper" J3 instead. If J1 is bridged (i.e. enabled), it disables the 7660 voltage converter and if J3 is bridged, the voltage converter is enabled. 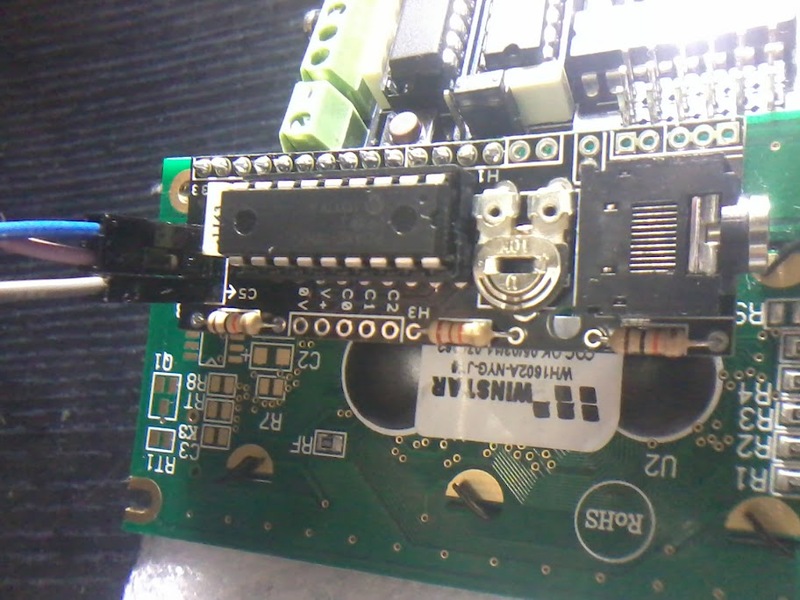 Note that the QAPASS 1602A LCD has the main 16-way connector in the "wrong" place for the AXE132 parallel/serial converter. It will still work fine, but it will stick out the side, rather than sitting neatly behind the LCD module. This may be an issue for some, but I have found it very hard to get hold of cheap parallel modules with the 16-way connector in the "right" place. RevEd seem to be out of stock too.